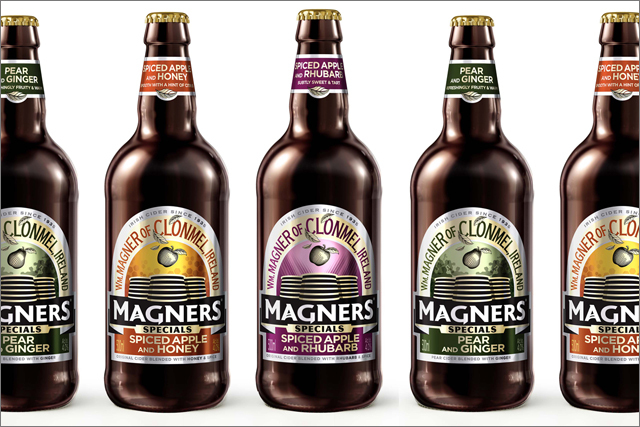 Magners, the cider brand, has become the first drinks company in the UK to sell its products directly on Facebook. The cider brand is now selling its newly launched Magners Specials range of blended ciders as a limited run of one thousand gift packs, priced at £10, on its Facebook page. Each pack contains one bottle of each of the new flavours: spiced apple and honey; spiced apple and rhubarb; and pear and ginger. It also contains a special edition bottle opener and booklet. The Facebook push, devised by glue Isobar, coincides with an augmented reality print campaign, which uses Aurasma technology to deliver exclusive mobile content. Smartphone users who have downloaded the Aurasma app hold their smartphones over the creative to access exclusive tasting notes on the new variants and can enter a competition to win a Magners-branded glass. The campaign, created by Red Brick Road, will appear on outdoor sites and in press and food titles this week. Media will feature an A in the corner of the ad to indicate it is Aurasma enabled. The print campaign was also handled by glue Isobar, while MPG Media Contacts handled the media. Kirsty Hunter, head of marketing at Magners, said: "We're excited to reveal a unique campaign to support the launch of Magners Specials, and one which we are confident will encourage our audience to indulge in something a bit different. "Being able to purchase these products via Facebook and integrating Aurasma into our creatives is exciting and bold and underlines the growing role that digital and social media has on the lives of our consumers." The alcohol industry is currently receiving heightened criticism of its increasing involvement with Facebook and lobby groups have accused drinks companies of using the platform to engage with younger consumers. The latest example comes from brand owner Diageo, which recently announced a multimillion-pound ad deal with Facebook, while earlier this year Marketing revealed Bacardi would be shifting 90% of its digital spend to Facebook initiatives. Just last week major alcohol brand owners, including Bacardi, Diageo and Pernod Ricard, agreed an alliance to pre-empt legislation and devised a set of self regulatory guidelines for advertising responsible marketing practices in social media. The practises include restricting Facebook users aged under-18 from accessing official alcohol brand pages, and a commitment to remove inappropriate user-generated content from brand pages on Facebook with 48 hours. In line with these guidelines, Magners has devised a three-tier security system that asks consumers to sign in to verify their true identity, followed by an age check on the credit card payment. A courier will also check the ID of a recipient on delivery. Commerce on Facebook, or "f-commerce" as it has been dubbed, is beginning to gain traction in the UK. At the start of this year, the fashion retailer Asos became the first brand in the UK to launch a fully transactional Facebook store. While retailers, such as the likes of French Connection and Best Buy, have largely led the way in f-commerce, other brands are entering the arena. O2 now allows customers to top up their accounts on Facebook, while Heinz recently sold 2,500 bottles of balsamic vinegar ketchup to Facebook fans. Heineken has also signalled plans to sell branded merchandise via the social network.